This book, one of the most haunting things that Roth ever composed, was published in 1939, the year the author died. Like Andreas, the hero of the story, Roth drank himself to death in Paris, but this is not an autobiographical confession. It is a secular miracle-tale, in which the vagrant Andreas, after living under bridges, has a series of lucky breaks that lift him briefly onto a different plane of existence. The novella is extraordinarily compressed, dry-eyed and witty, despite its melancholic subject-matter. 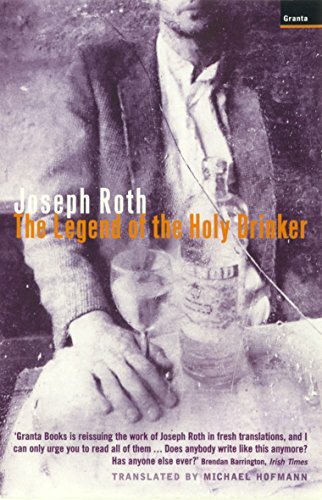 The Legend of the Holy Drinker was tumed into a film by Enrico Olmi, starring Rutger Hauer. Joseph Roth (1894-1939) was the great elegist of the cosmopolitan, tolerant and doomed Central European culture that flourished in the dying days of the Austrian Empire. He wrote thirteen novels, including The Radetzky March and The String of Pearts.